The Chicago Cubs head to Busch Stadium on Monday to take on the St. Louis Cardinals. The probable pitchers are Kyle Hendricks for the Cubs and Mike Leake for the Cardinals. The Cubs have a 64-70-7 over/under mark and a 74-67-0 run line record, meaning they cover 53% of the time. The Cardinals are 66-75-0 against the run line and have a 76-59-6 over/under record. They cover the spread 47% of the time. The Cubs head into this game with a 90-51 record, and they are 39-31 on the road. Starting pitcher Kyle Hendricks has a 14-7 record with an ERA of 2.07 and a WHIP of 0.99. He has 145 strikeouts during his 165 innings pitched and he has given up 122 hits so far this year. He has surrendered 6.7 hits per 9 innings and he has a FIP of 3.36. The bullpen this season has an earned run average of 3.39 and they have allowed 323 base hits on the year. Teams are hitting .209 against the pen while they've been struck out 450 times and walked 173 times this year. As a unit, Chicago has given up 6.89 base hits per nine innings while striking out 8.83 hitters per nine. They are 1st in the Majors in team earned run average at 3.05. The Cubs pitchers have collectively given up 979 base hits and 437 earned runs. They have allowed 141 home runs this season and they allow 1.1 homers per nine innings as a staff. Chicago as a pitching staff has walked 438 batters and struck out 1,253. They walk 3.1 men per 9 innings while striking out 8.8 per 9. They have a team WHIP of 1.11 and their FIP as a unit is 3.77. As a team, Chicago is hitting .254, good for 18th in the league while putting together a .259 average on the road. The Cubs have a .425 team slugging percentage and an OBP of .341 which is good for 2nd in the league. They rank 18th in baseball with 8.65 hits per contest. Anthony Rizzo comes into this game hitting .292 and his on-base percentage is at .390. He has 150 hits this season along with 85 runs scored and 97 runs batted in. He's struck out 93 times and has walked 68 times. Kris Bryant is hitting .299 and he has an on-base percentage of .395. He has totaled 159 hits so far while scoring 113 runs and he's driven in 93. He has walked 69 times and has struck out 134 times. The Cubs have 1,219 hits, including 256 doubles and 172 home runs. They've stolen 57 bases while they've been thrown out stealing 31 times. Chicago has walked 569 times this season and they've struck out 1,175 times as a unit. They've left 1,055 men on base and have a team OPS of .767. They score 4.96 runs per contest and have scored a total of 700 runs so far this year. St. Louis comes into this game with a 32-38 home mark and a 75-66 overall record. With an ERA of 4.61, Mike Leake has a 9-9 record and a 1.30 WHIP. He has 111 strikeouts over the 156.1 innings he's pitched during which he has given up 178 hits. He has allowed 10.2 hits per nine innings and his FIP stands at 3.84. So far this season the bullpen has an earned run average of 3.63 and they have given up 371 base hits on the year. Teams are hitting .228 against the Cardinals bullpen while being struck out 427 times and walking 165 times this season. As a team, St. Louis has allowed 8.81 hits per nine innings while striking out 7.93 batters per nine. They are 10th in the league in team earned run average at 4.05. The Cardinals pitchers as a team have surrendered 1,238 base knocks and 569 earned runs so far this season. They have given up 134 home runs this year and they give up 1.1 home runs per nine innings as a staff. St. Louis as a staff has walked 413 hitters and struck out 1,114. They give up a walk 2.9 times per 9 innings while they strike out 7.9 per 9. Their team WHIP is 1.31 while their FIP as a staff is 3.86. As a team, they are batting .256, good for 16th in the league while putting together a .255 average at home. The Cardinals hold a .448 team slugging percentage and an on-base percentage of .328 which is good for 11th in baseball. They rank 14th in baseball with 8.85 hits per contest. Stephen Piscotty comes into this matchup batting .279 and he has an OBP of .350. He has 142 hits this year along with 79 runs scored and 80 RBI. He's struck out 114 times and has walked on 46 occasions. 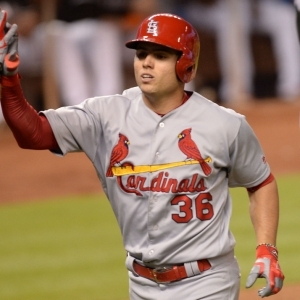 Aledmys Diaz is hitting .312 and he has an OBP of .376. He has collected 110 hits so far while he's scored 64 runs and drove in 57. He has earned a walk 34 times and has punched out 54 times. The Cardinals as a unit have 1,249 base hits, including 264 doubles and 204 homers. They have 32 stolen bases while they've been thrown out 23 times. St. Louis as a team has walked 470 times this year and they have struck out 1,142 times. They've had 987 men left on base and have an OPS of .776. They score 4.94 runs per game and have totaled 696 runs so far this season.